White Label Wednesday: Romeo Void, "A Girl in Trouble (Is a Temporary Thing)"
People like to joke that if the Rolling Stones were to debut today, they would never be popular because they’re not attractive enough. This is not entirely accurate. I can’t imagine that a single member of Fall Out Boy or Panic at the Disco had much luck with women until they sold millions of records, so there would have been hope for the Stones in today’s go-fabulous-or-go-home musical climate once they brought the rock. Romeo Void, on the other hand, would not have a prayer. At the risk of sounding insensitive, it all comes down to one simple thing: Romeo Void’s lead singer Debora Iyall was a girl. A big, big girl. And that is simply not allowed these days. It doesn’t really matter that Iyall had attitude to spare and one of the most unique voices of her time, a smoky alto that could handle snotty new wave and torch songs with equal aplomb. (I’ve never actually heard Iyall sing torch songs, but if she did, I just know they’d sound awesome.) Nope, today’s record execs would toss the band’s press kit in the trash the second they saw that full frame. Say this for the ’80s: a lot of bands may have gotten a contract because of their flashy looks, but the labels were still willing to let a band’s music do the talking in the event that they didn’t have pinup looks. Who knows, maybe nostalgia is clouding my judgment on this. Wouldn’t be the first time. Without any historical context, it makes sense that song like “A Girl in Trouble (Is a Temporary Thing)” would crawl into the back door of the Top 40 when it did (it peaked at #35 in October 1984). Its blend of minor keys and super-catchy sax line (saxophones were practically required by law back then, you know), propelled by a danceable drum beat, was of its time while slightly outside of it as well. What doesn’t make sense is that this is the same band that, just two years earlier, made their name with a stomping slice of post-punk called “Never Say Never,” which sported the unforgettable line “I might like you better if we slept together.” Was the decision to adopt a more, ahem, mature sound (musicians hate that word) the band’s call, or the label’s? Honestly, I have no idea. Those two songs I listed above are still the only two songs I’ve ever heard by the band, that I remember, anyway. In either case, it was 1984, which means that if the label thinks it has a shot at a hit, they’re commissioning a remix. 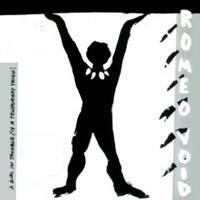 Since Romeo Void was on Columbia (technically, they were on San Francisco-friendly imprint 415, which was distributed by Columbia), they had house producer David Kahne behind the desk and our good friend Francois Kevorkian, who’s rivaling Arthur Baker for WLW face time, handling remix duties. Truth be told, Mr. Kevorkian doesn’t do much here but stretch out the instrumental breaks and add a few big claps behind the snare drum, but in his defense, “A Girl in Trouble” is not the kind of song that would stand up to a bunch of stutter edits and overblown sampling. So while it’s not an outstanding example of remix work, I like the fact that songs like this merited a remix back in the day. A quick word to audiophiles: I downloaded this mp3 about ten years ago. It’s clearly a vinyl rip, with those snake-like s’s hissing throughout. Sorry about that.